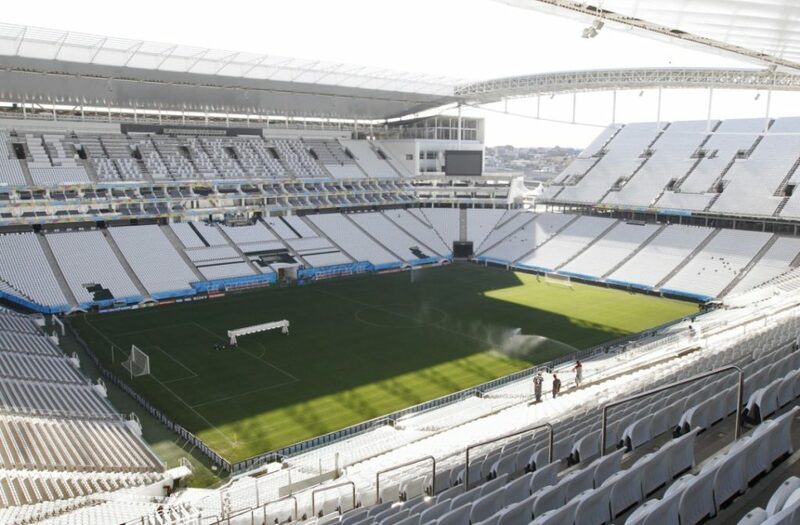 Arena Corinthians. Photo: José Cordeiro/ SPTuris. FIFA World Cup in Brazil. The stadium in Itaquera hosted seven games, among them South Korea vs. Belgium – which had over 61 thousand people in attendance. 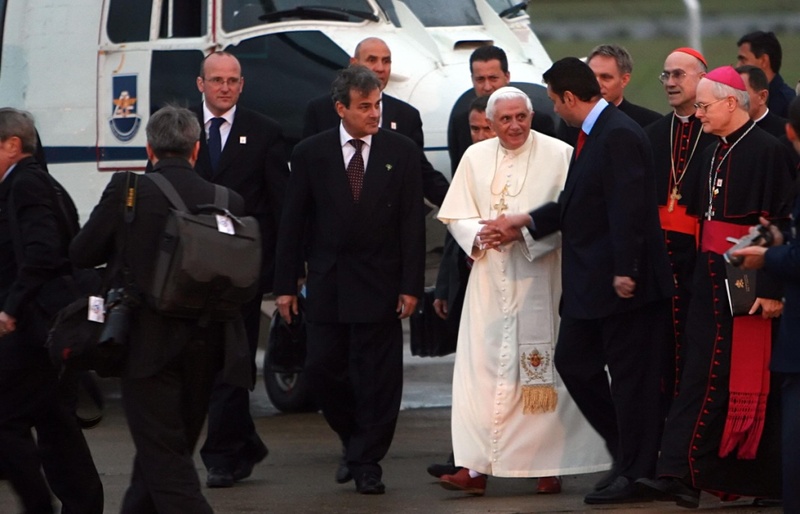 Pope Benedict XVI’s visit from May 9th to 13th; when he performed a mass at Campo de Marte for over 1 million people. Foundation of Museu da Língua Portuguesa, one of the most visited in Brazil (currently undergoing renovation). Museu da Língua Portuguesa, at Luz Station. Photo: José Cordeiro/ SPTuris. The City Hall headquarters moves from Palácio das Indústrias to Edifício Matarazzo. Matarazzo Building. Photo: José Cordeiro/ SPTuris. Renovation and conclusion of the Catedral da Sé towers. 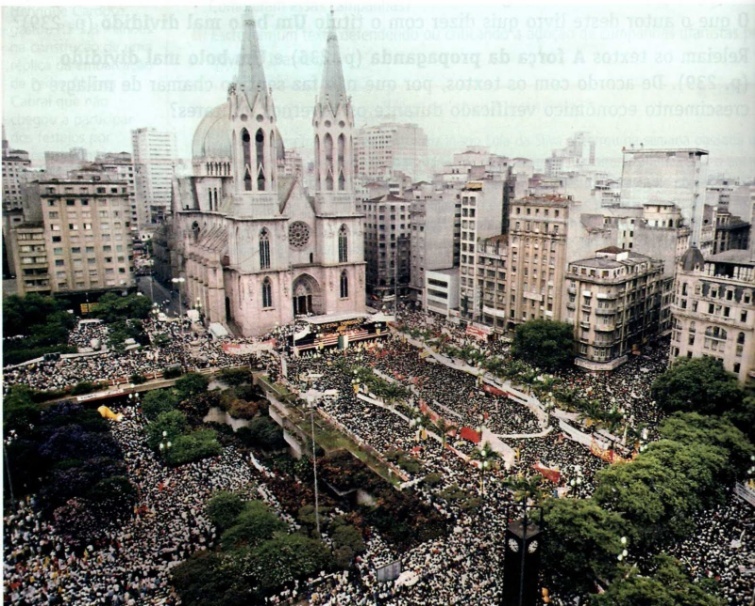 Inauguration of Centro Cultural Banco do Brasil, in April 21st 2001, aiming at change the way locals used to handle the so-called Old Downtown. Entrance of CCBB. Photo: Acervo Estadão. Inauguration of Centro Cultural Julio Prestes, where Sala São Paulo is located. 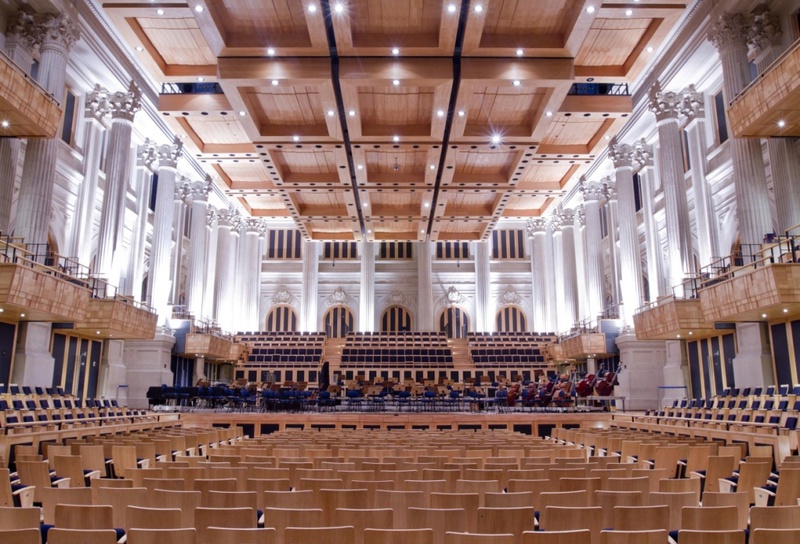 The concert room has 1498 seats available and it’s the home of Orquestra Sinfônica do Estado de São Paulo (Osesp). Sala São Paulo. Foto: José Cordeiro/ SPTuris. 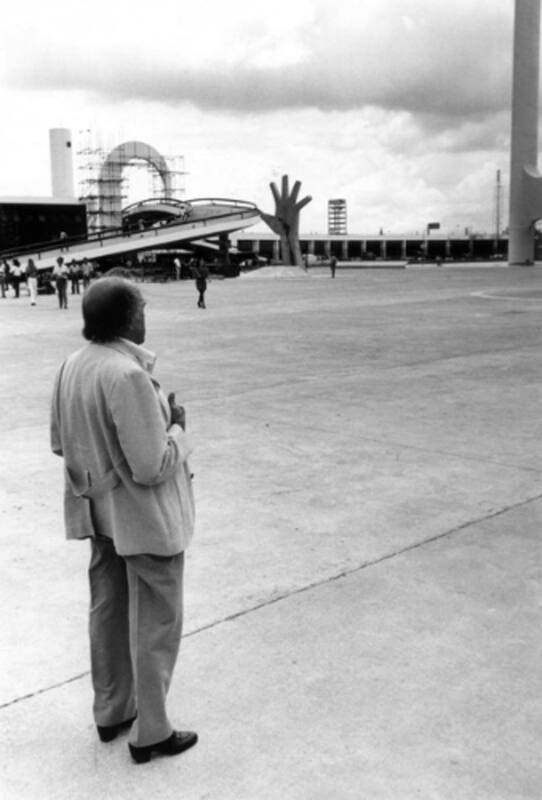 Sambódromo do Anhembi is inaugurated and has its first parade, projected by architect Oscar Niemeyer. 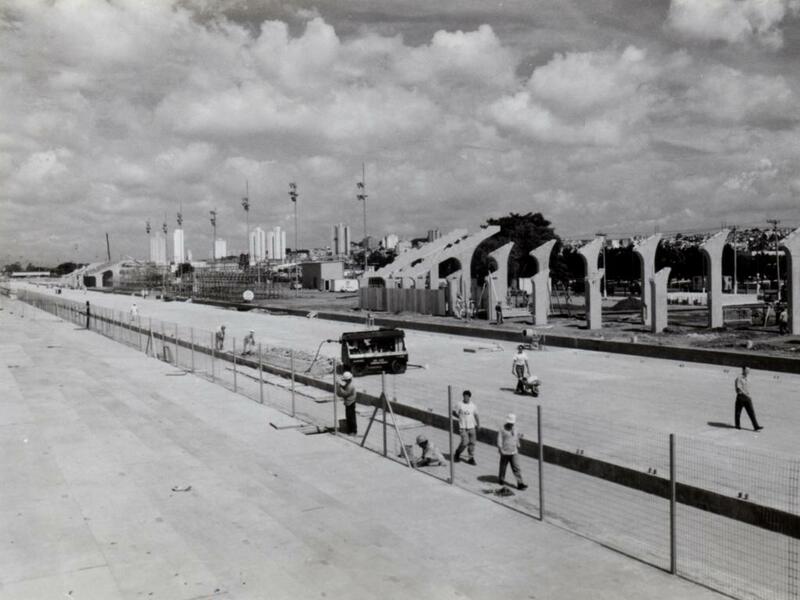 Construction of Sambódromo do Anhembi. Photo: Acervo SPTuris. Beginning of the Memorial da América Latina construction, a cultural project of Darcy Ribeiro and architecture of Oscar Niemeyer. Memorial da América Latina was opened on March 18th 1989. Photo: Acervo Estadão. “Diretas Já” demonstration takes place at Praça da Sé. Diretas Já at Praça da Sé. Photo: divulgação. 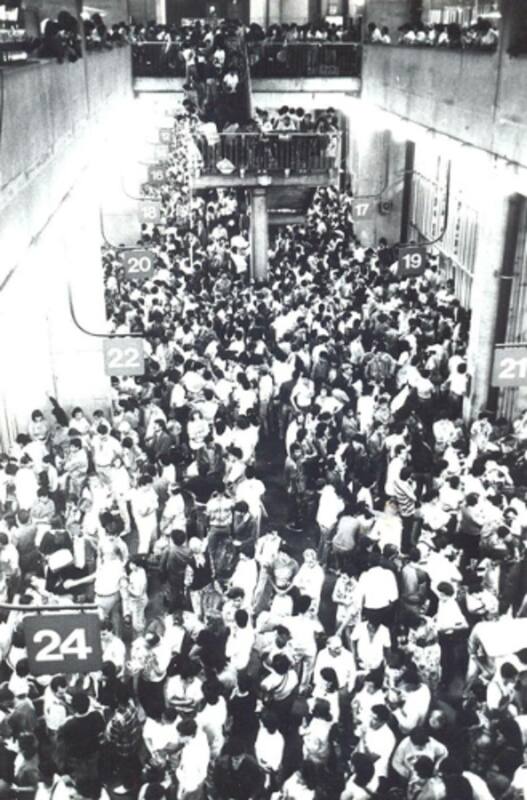 On May 8th 1982, Bus Terminal Tietê is inaugurated, one of the busiest in the world. Bus Terminal Tietê. Photo: Acervo Estadão. 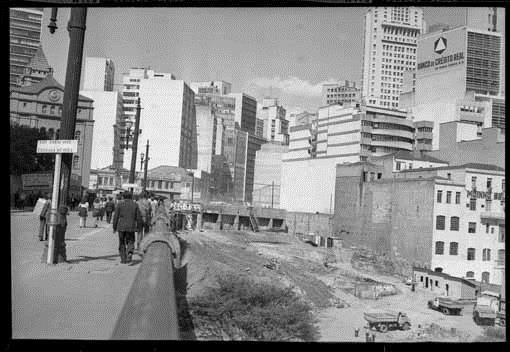 Construction site at subway station São Bento – 1972. Photo: Camerindo Ferreira Máximo. 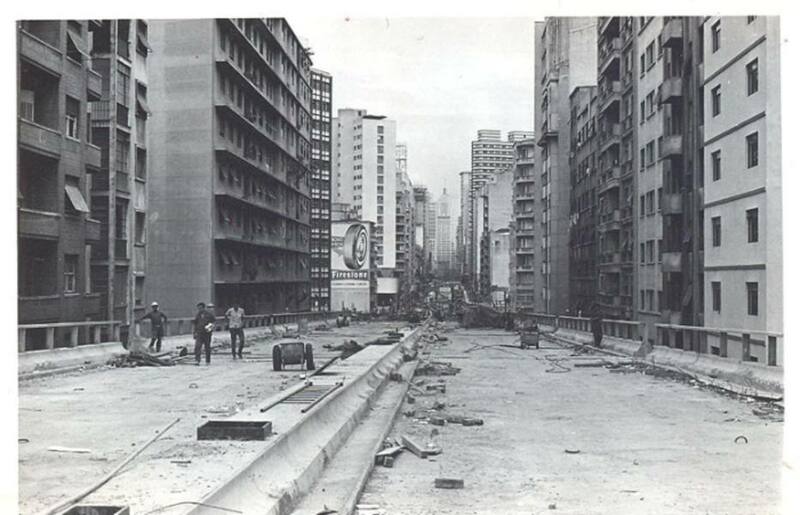 Inauguration of Elevado Costa e Silva, popularly known as Minhocão, in January 1971, after a building record for such a big construction work: one year and a half. Construction of Minhocão. Photo: Acervo Estadão. The current MASP building is opened in Avenida Paulista, with the presence of Queen Elizabeth II, from England. 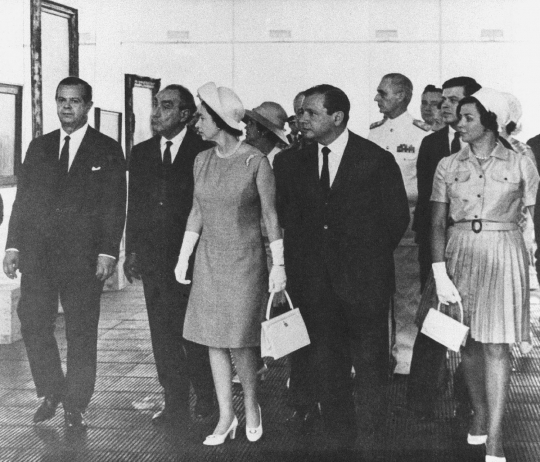 Queen Elizabeth at Masp’s inauguration. Photo: Acervo Estadão. Itália building is inaugurated, with the nicest panoramic view of the city. Itália building. Foto: Acervo Estadão. 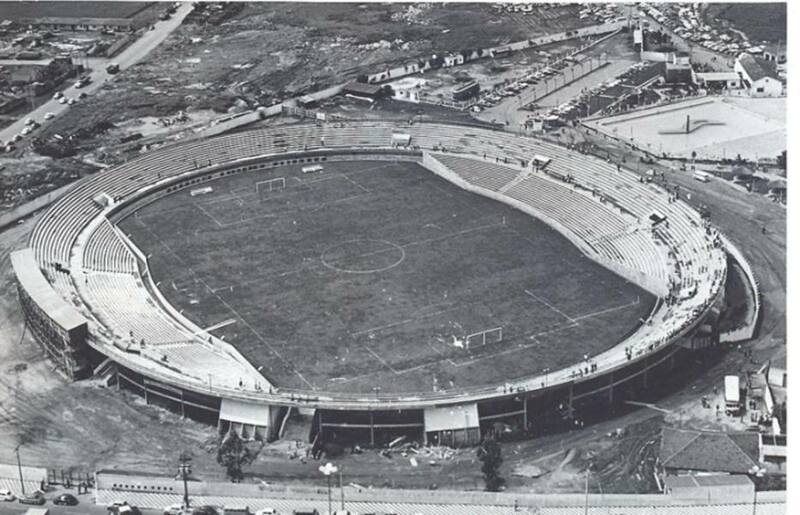 Estádio do Canindé is inaugurated, one of the first stadiums in São Paulo. The Monumento às Bandeiras was inaugurated in 1954, alongside with Ibirapuera Park, in celebration to the IV Centenary of the city of São Paulo. 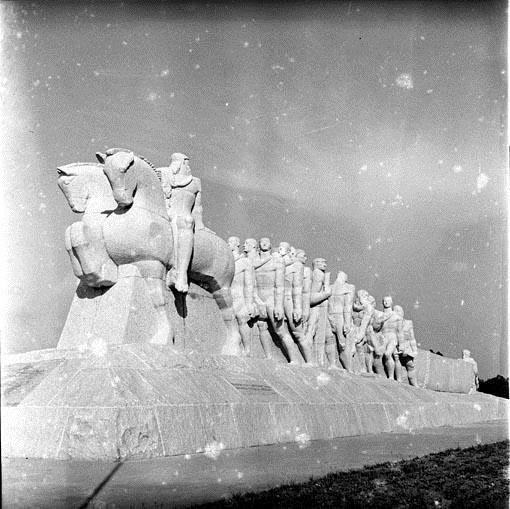 Monument in tribute to the Bandeiras, 1954. Photo: Benedito Junqueira Duarte. The Companhia Teatro de Arena was founded in 1953, with the premiere of the Museu de Arte Moderna de São Paulo rooms. 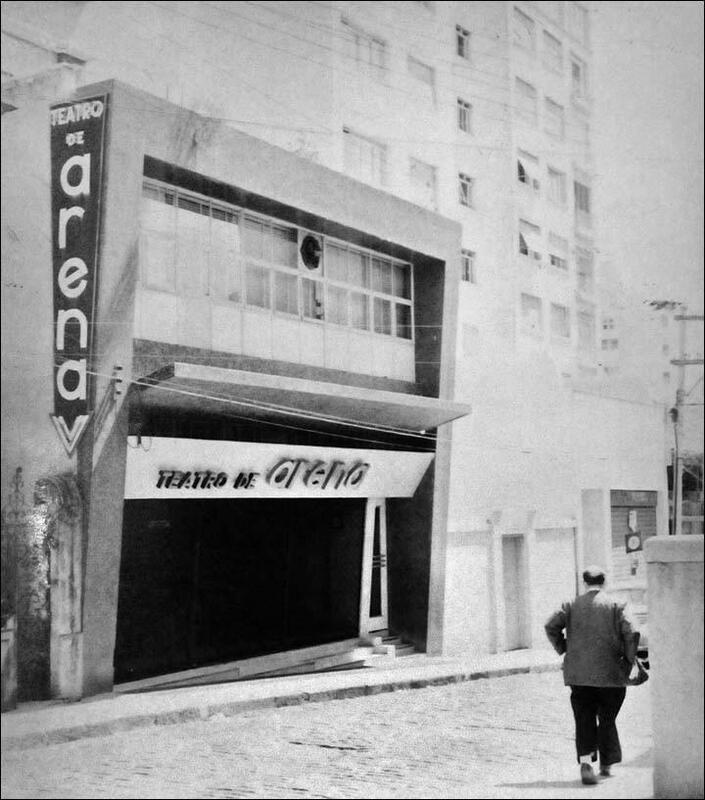 In 1955, Companhia becomes Teatro de Arena, with its headquarters in Rua Teodoro Bayma, 94. 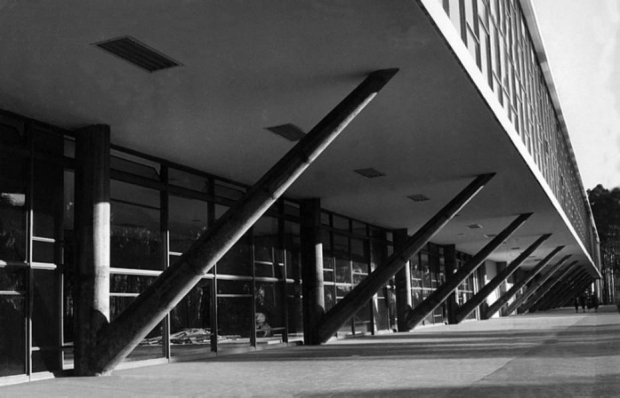 Outside of Teatro de Arena on the 1950s. Photo: Acervo Funarte. 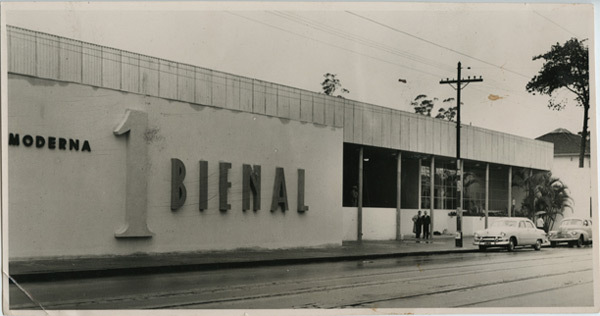 The 1ª Bienal Internacional de São Paulo happens in the city. Creation of Museu de Arte Moderna de São Paulo – MAM (Modern Art Museum). MAM in the 1950s. Photo: Acervo Estado de São Paulo. 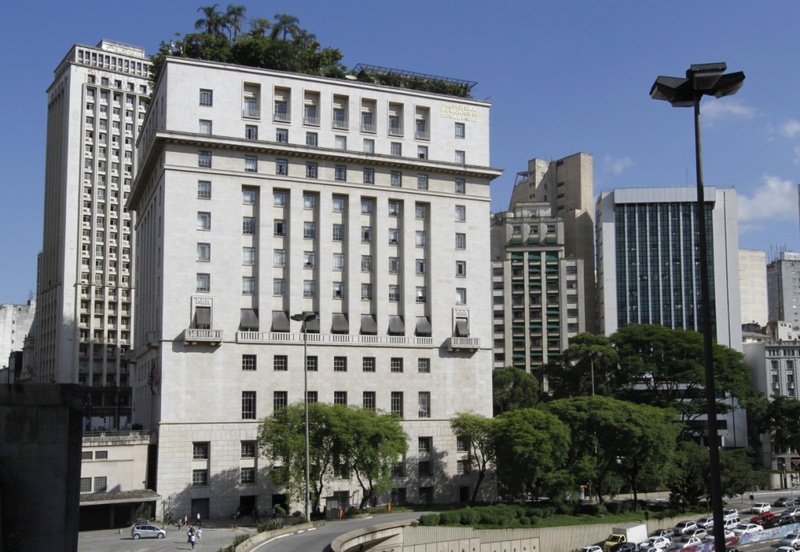 The Altino Arantes building is founded by governor Ademar de Barros, in June 27th. 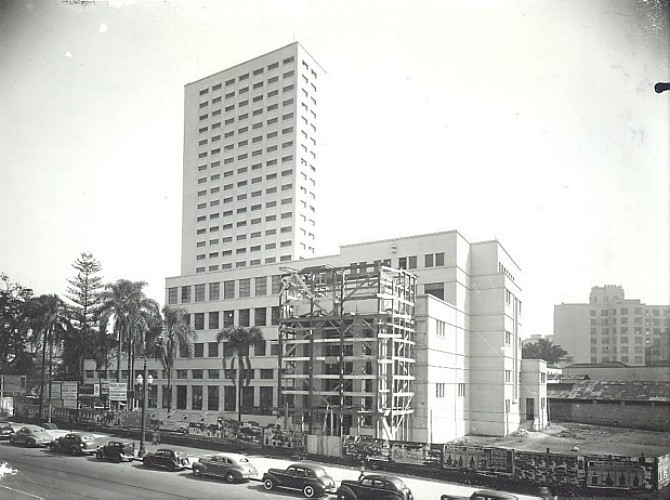 Edifício Altino Arantes in the early 1950s. On May 12th, the Autódromo de Interlagos is opened with the São Paulo Grand Prix race. 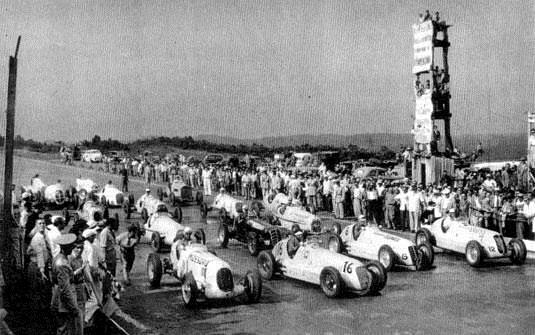 Starting line São Paulo Grand Prix, 1940. Viaduto do Chá is inaugurated. 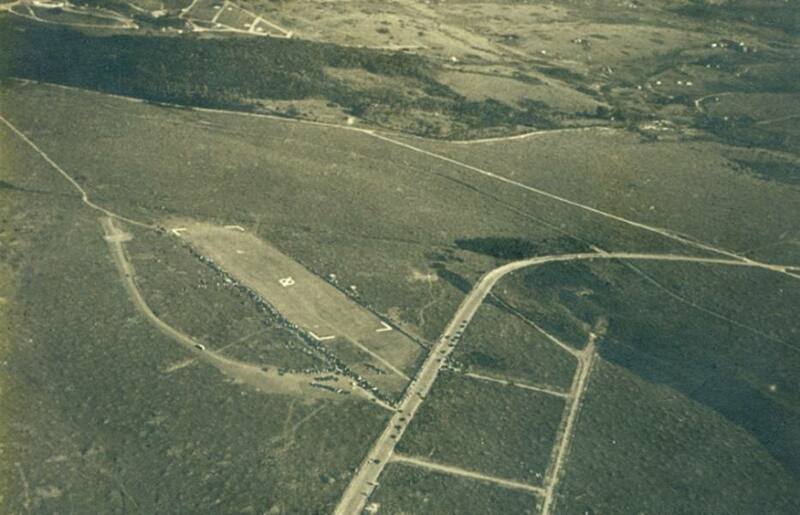 Inauguration of Congonhas Airport, in April of 1936. On the 1950s, the airport was one of the busiest of the world in air cargo volume. Airview from Congonhas Airport. Photo: Acervo Estadão. 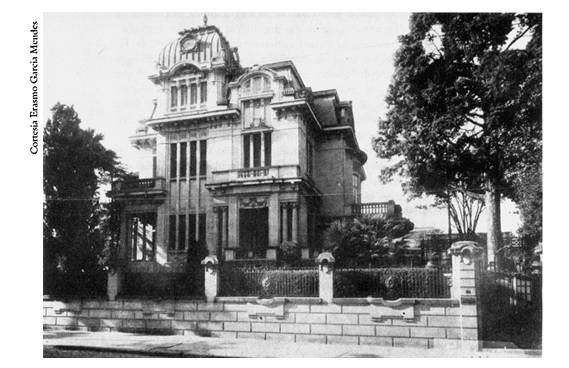 On January 25th, Universidade de São Paulo (USP) is founded. First Faculdade de Filosofia, Letras e Ciências Humanas building, at Maria Antônia Street. Photo: Erasmo Garcia Mendes. 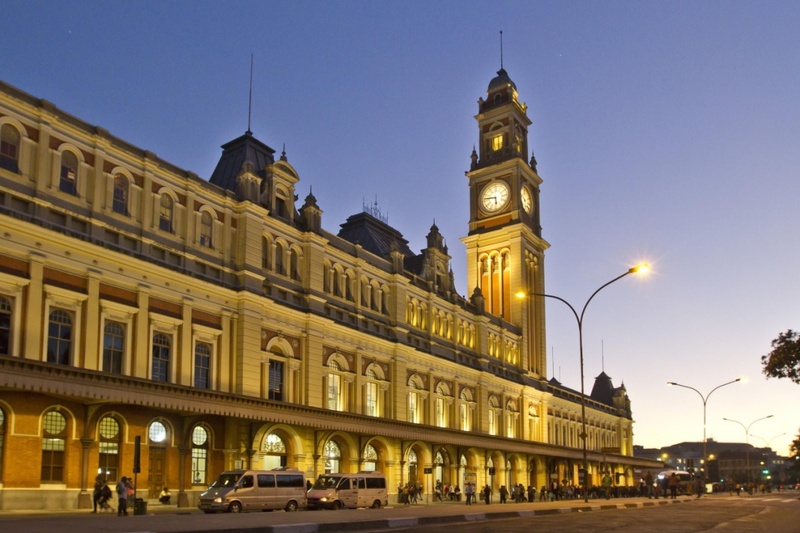 Mercado Municipal is inaugurated, replacing the old Mercado Central. 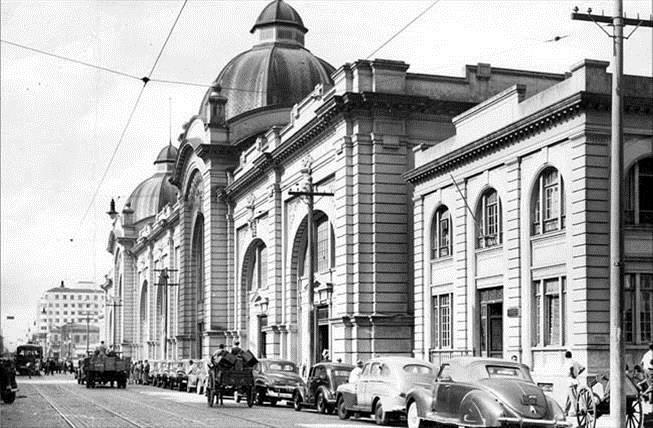 Mercado Municipal in 1950. 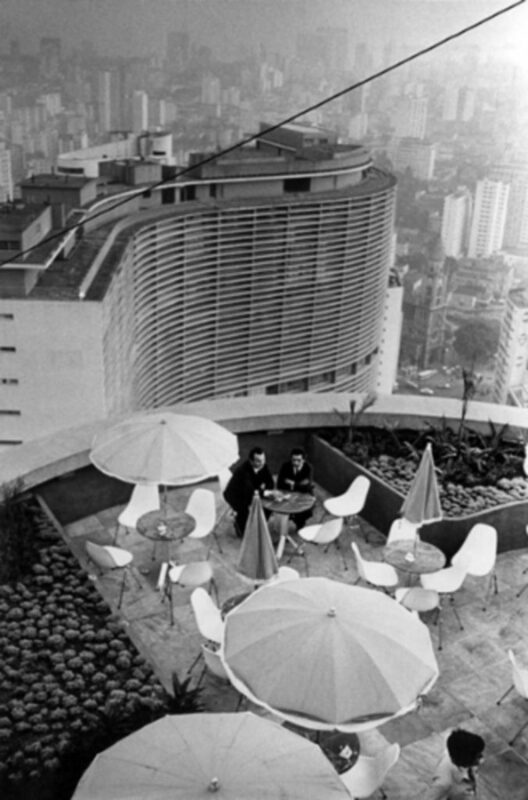 Photo: São Paulo Antiga. 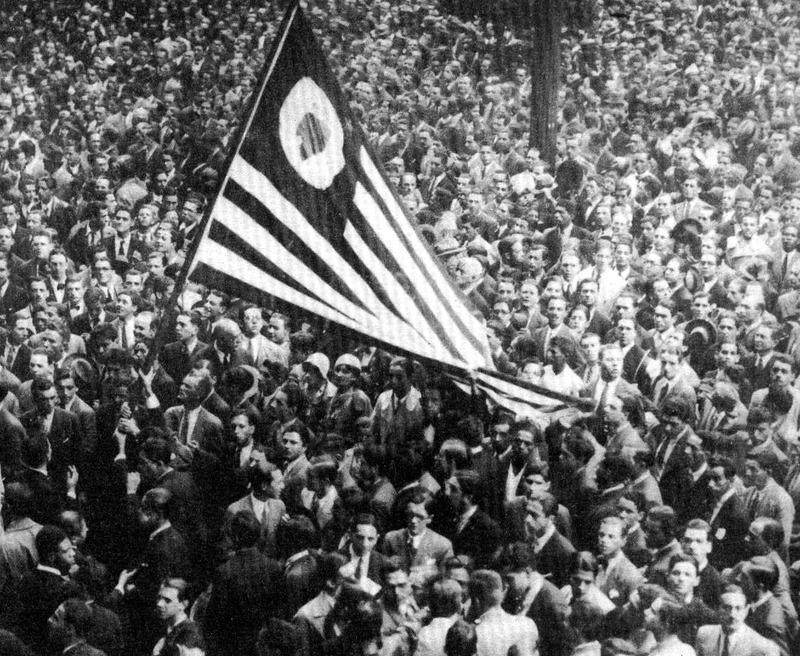 In 9 of July, there is the Revolução Constitucionalista (Constitutional Revolution). 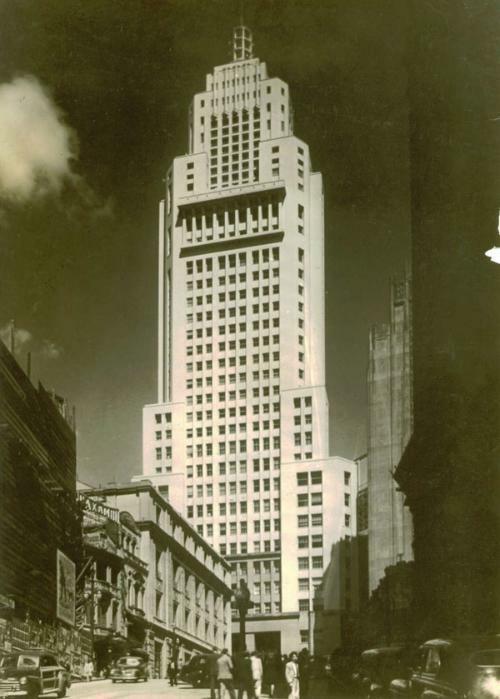 Edifício Martinelli is inaugurated; it was idealized by Italian Giuseppe Martinelli and began constructions in 1924. 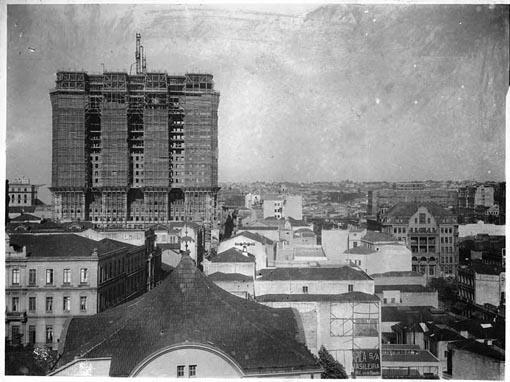 Edifício Martinelli in construction (1925-1927). Photo: Aurélio Becherini. 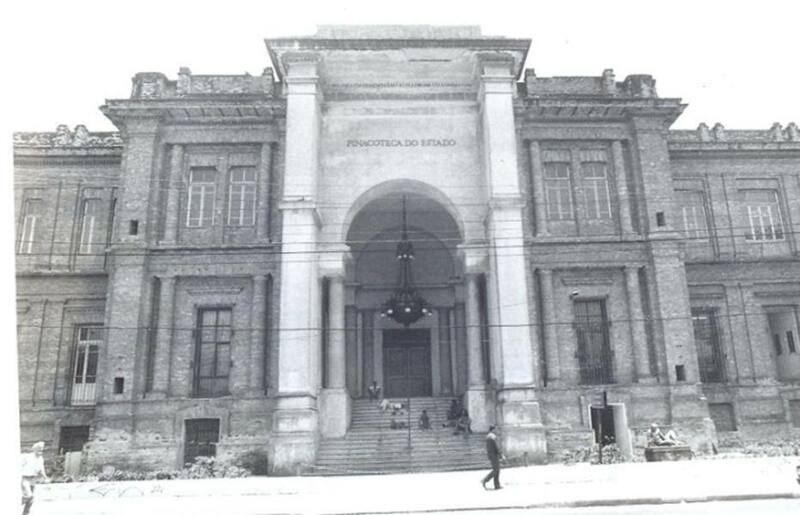 The city’s first public library is founded – Biblioteca Mário de Andrade. Biblioteca Mário de Andrade. Photo: Postal Colombo. Beginning of bus circulation on the city of São Paulo. 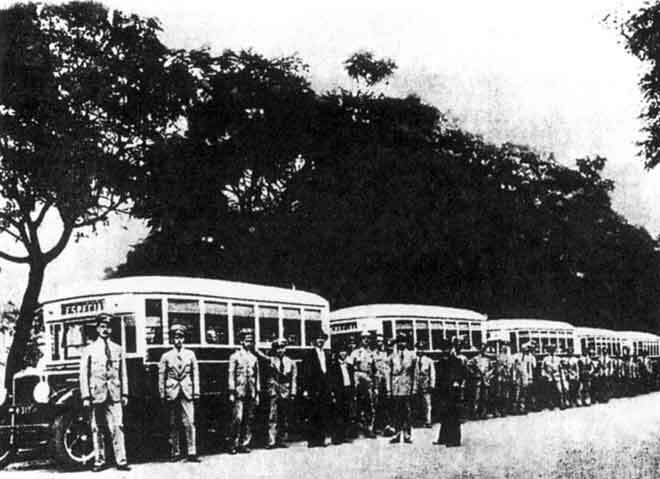 Empresa Paulista de ônibus Mooca buses, at their foundation day, on 1934. Photo: Ônibus Brasil. Semana de Arte Moderna (Modern Art Week) at Theatro Municipal. 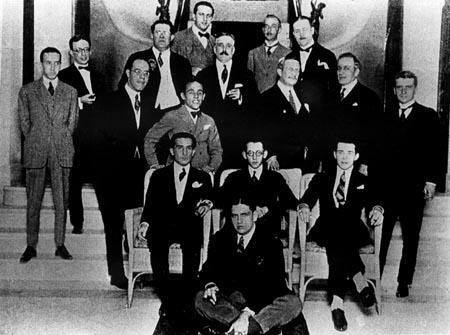 Participants of Semana de Arte Moderna: From left to right: Couto de Barros, Manuel Bandeira, Mário de Andrade, Paulo Prado, René Thiollier, Graça Aranha, Manuel Villaboim, Gofredo Silva Telles, Cândido Mota Filho, Rubens Borba de Moraes, Luís Aranha, Tácito de Almeida and Oswald de Andrade. The city’s first airport is founded, Aeroporto Campo de Marte. Campo de Marte on the 1930s. Photo: icg.sp.gov.br. Founding of the Penitentiary Complex of Carandiru. 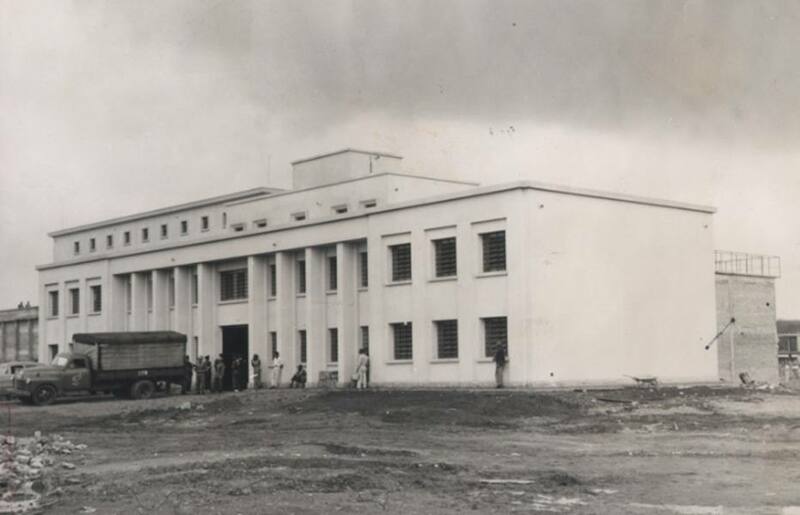 View of the first pavilion of Casa de Detenção do Complexo Penitenciário Carandiru – 1950s Photo: Acervo Estado de São Paulo. 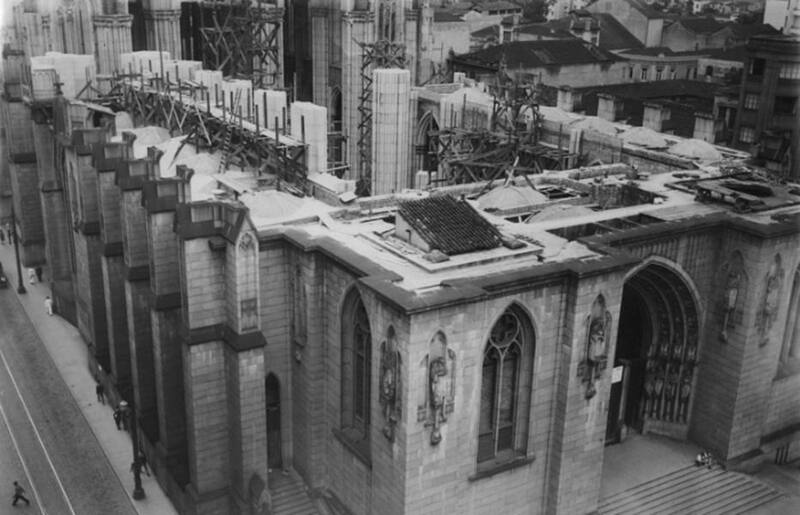 Beginning of the construction of Catedral da Sé; a project elaborated by German Architecture Professor of Escola Politécnica Maximilian Emil Hehl. The Theatro Municipal is opened to public on September 12th. The Pinacoteca do Estado de São Paulo is opened, the city’s first art museum. Pinacoteca do Estado, at Jardim da Luz, Downtown. Photo: Acervo Estadão. Official opening of the city’s first stadium, the Velódromo Paulistano, on October 19th with a game between Paulistas and Cariocas. 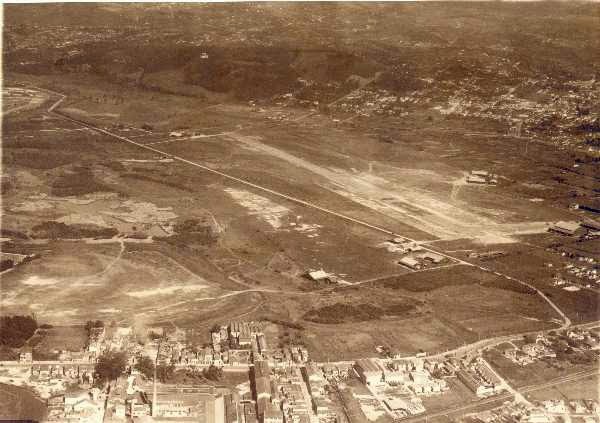 Location of the old Velódromo Paulista 1919. Inauguration of Estação da Luz, project inspired on London’s Westminster Abbey, on March 1st. 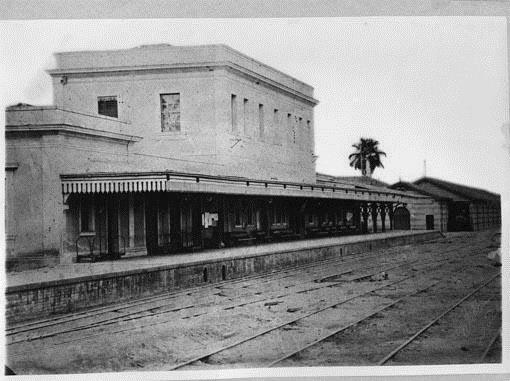 Old Estação da Luz – 1880-1900. Photo: Pedro Hoenen. The building that hosted the Liceu de Artes e Ofícios gave place to the Pinacoteca do Estado de São Paulo. 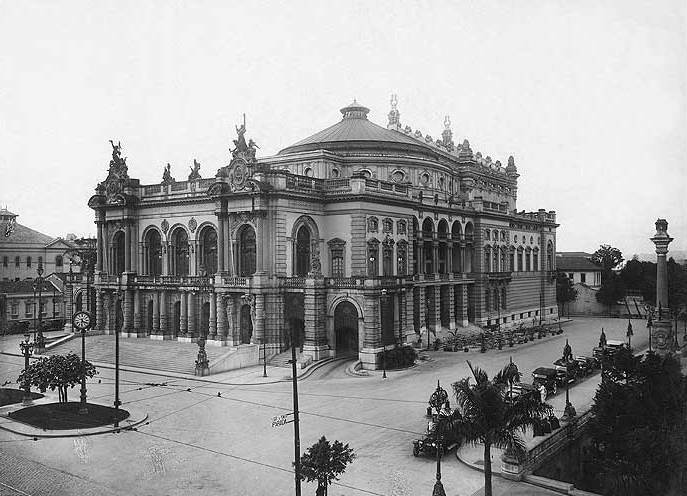 The current Estação da Luz building was constructed between 1895 and 1901. Photo: Acervo Estado de São Paulo. Electric illumination and streetcars are inaugurated. 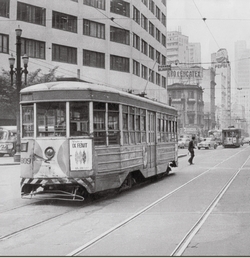 Electric Streetcars. Foto: Folha Press. 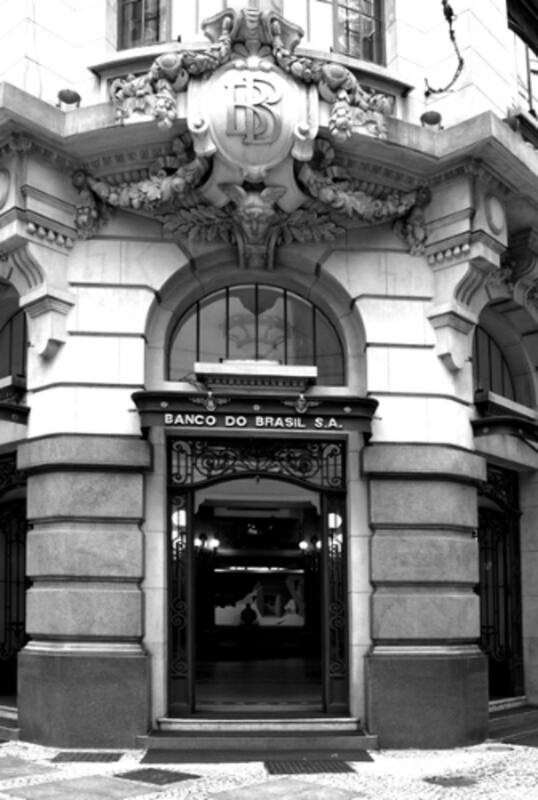 São Paulo’s govern builds a laboratory for the production of serum to fight against a Bubonic Plague outburst. 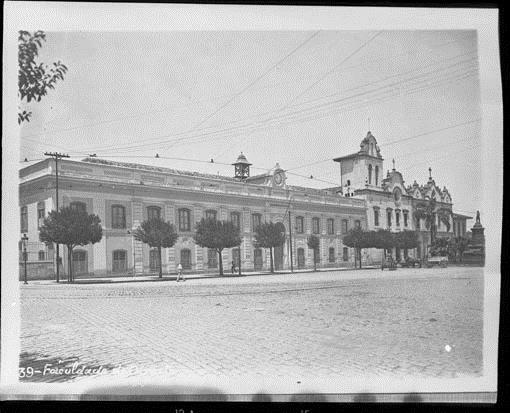 The place later would become Instituto Butantan, in 1901. 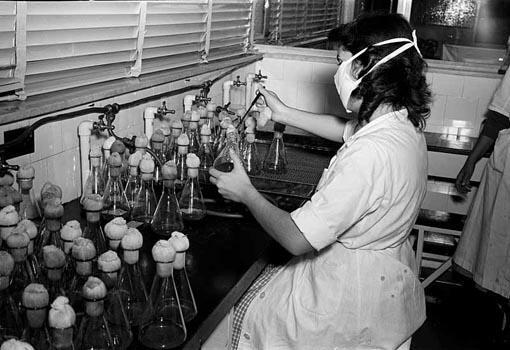 Serum preparation – 1953 – Photo: Gabriel Zellaui. 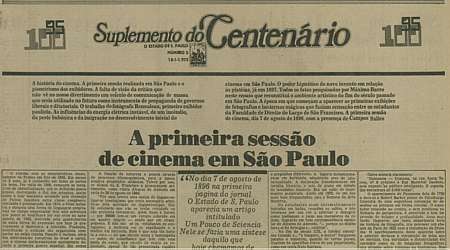 On August 7th 1896, the first private film projection occurs in São Paulo. On the 8th, there is the first public and paid exhibition, nearby the old Catedral da Sé, with Renouleau’s cinematographer. 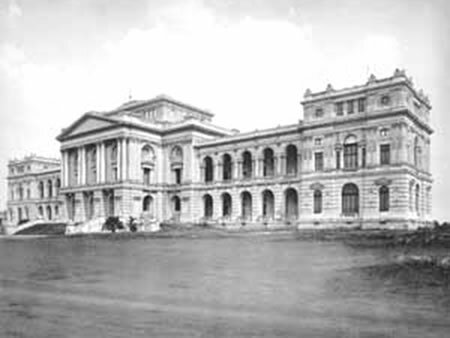 The Museu Paulista (Museu do Ipiranga) is inaugurated in September 7th, 1895. Museu Paulista. Photo: Acervo da Prefeitura de São Paulo. Viaduto do Chá is created, with wooden constructions. It gets this name due to its proximity to the tea plantation of Índia. 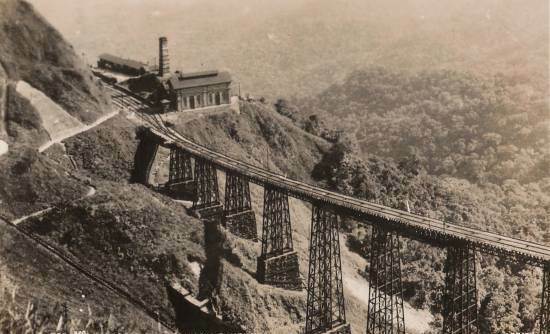 Viaduto do Chá and Vale do Anhangabaú – 1896. Photo: Hagop Garagem/ divulgação. 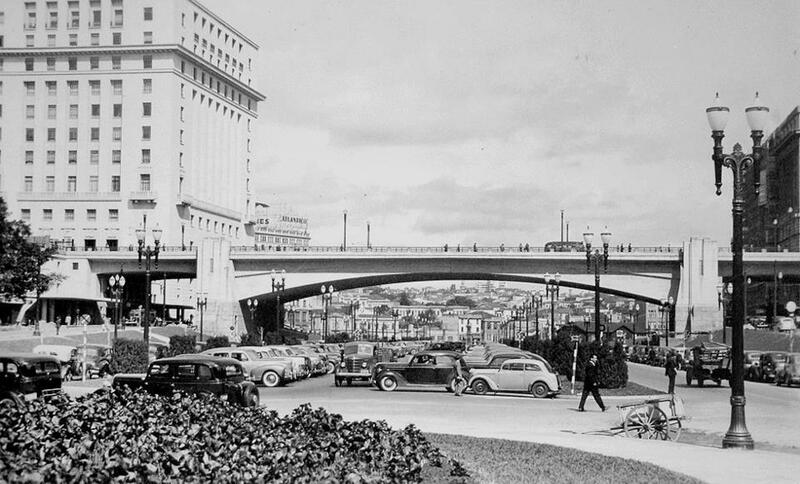 Avenida Paulista is opened; formed by the high coffee aristocracy and industrial bourgeoisie. 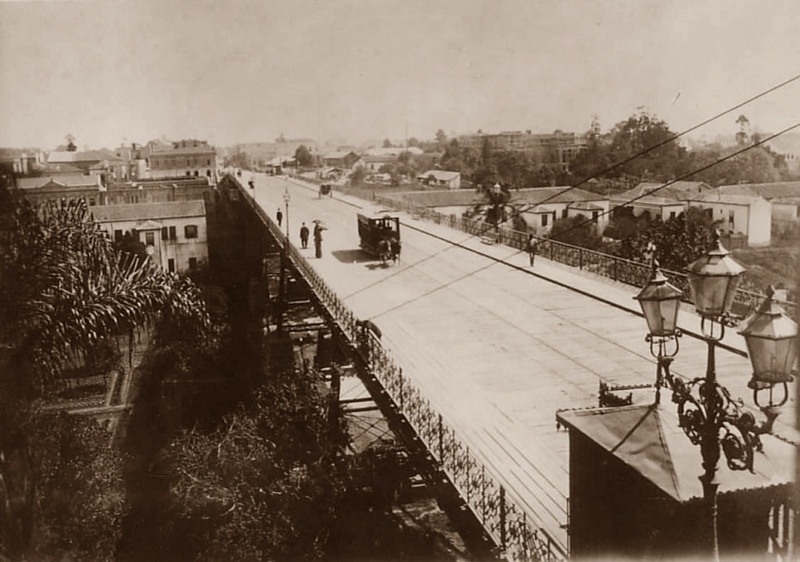 Avenida Paulista in 1902. Photo: Acervo Instituto Moreira Salles. 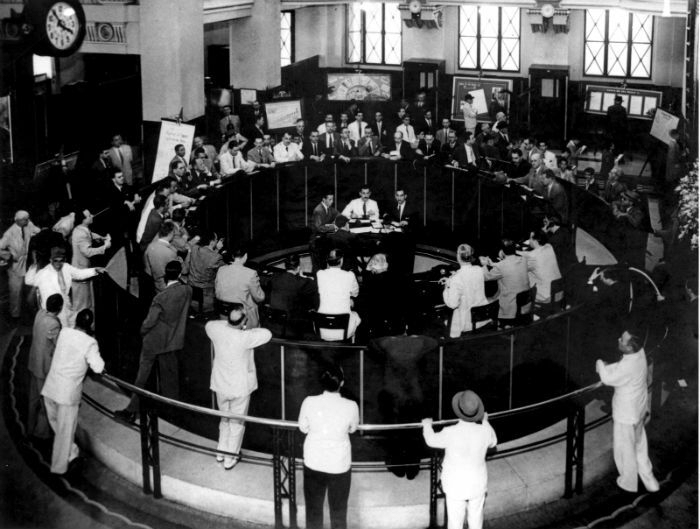 In August 23rd 1890, São Paulo’s stock market was created – Bovespa, by a group of business agents led by Emílio Rangel Pestana. Bovespa. Photo: Divulgação BM&F Bovespa. The city gets the services of sewer, water supplying, gas illumination, besides horsecar lines. 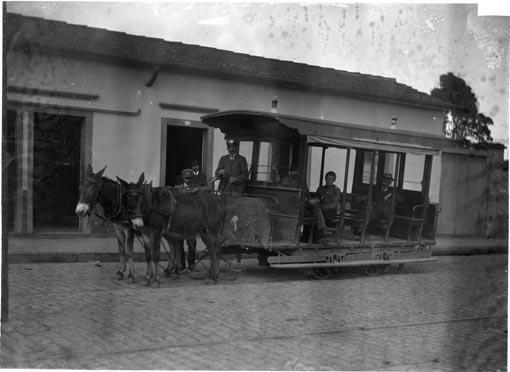 The Companhia Carris de Ferro creates the first collective transportation: mulecars tramway service. Mulecar – 1875. Photo: Acervo Fotográfico do Museu da Cidade de São Paulo. 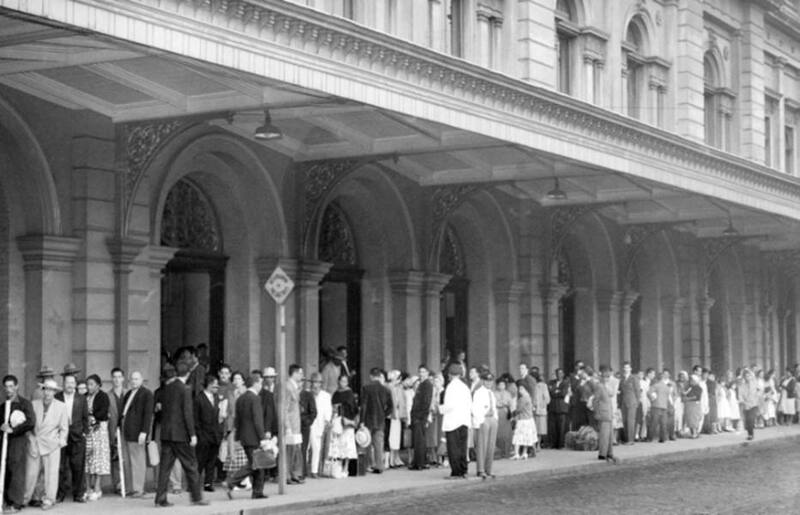 São Paulo’s first railway is opened – the Estrada de Ferro Santos-Jundiaí, by the English company São Paulo Railway, to transport the coffee produced from Jundiaí to Campinas, to the port of Santos, which would become the main outlet of the coffee production. Estrada de Ferro Santos-Jundiaí. Photo: Cartão Postal do acervo do professor e pesquisador Francisco Carballa. The first Public Cemetery is inaugurated in Rua da Consolação. 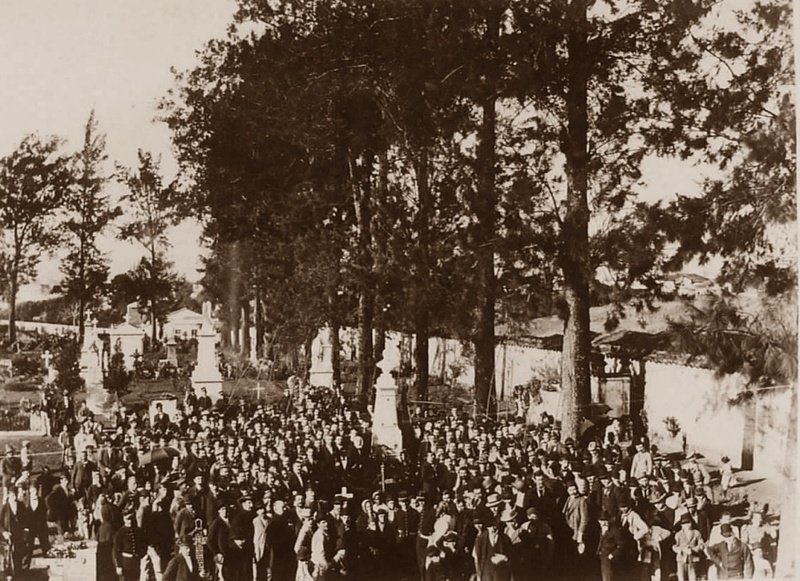 Inauguration of the Monument to Sadi Carnot at Cemitério da Consolação – 1894. Photo: Hagop garagem/ Release. By determination of the Emperor, the Academia de Direito do Largo de São Francisco (law school) is created. Faculdade de Direito – 1975. Photo: Edison Pacheco Aquino. 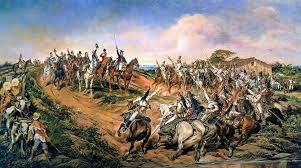 At the riverside of Rio Ipiranga, D. Pedro I proclaims Brazilian Independence and the city of São Paulo becomes Administrative Headquarters of the Province. Independência ou Morte Painting. Artist: Pedro Américo. 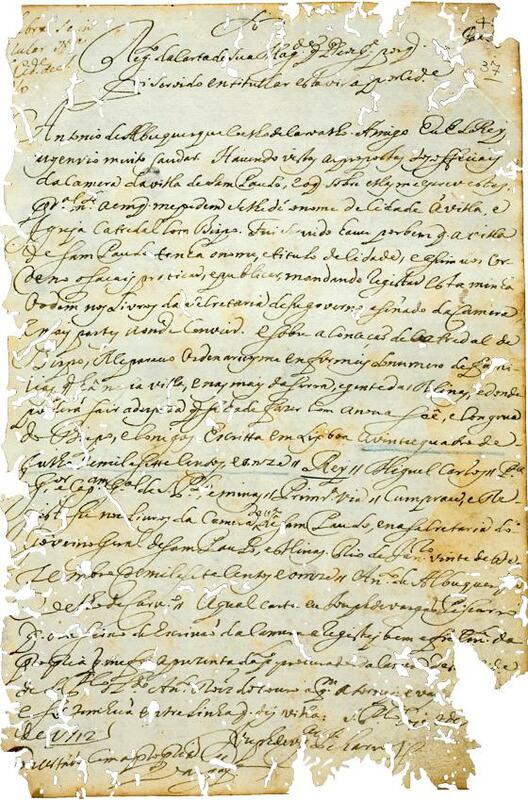 Dom João VI, through a royal letter, elevates the Vila de São Paulo de Piratininga to the status of city – in July 11th, 1711. Letter document that elevates the village to the status of city. 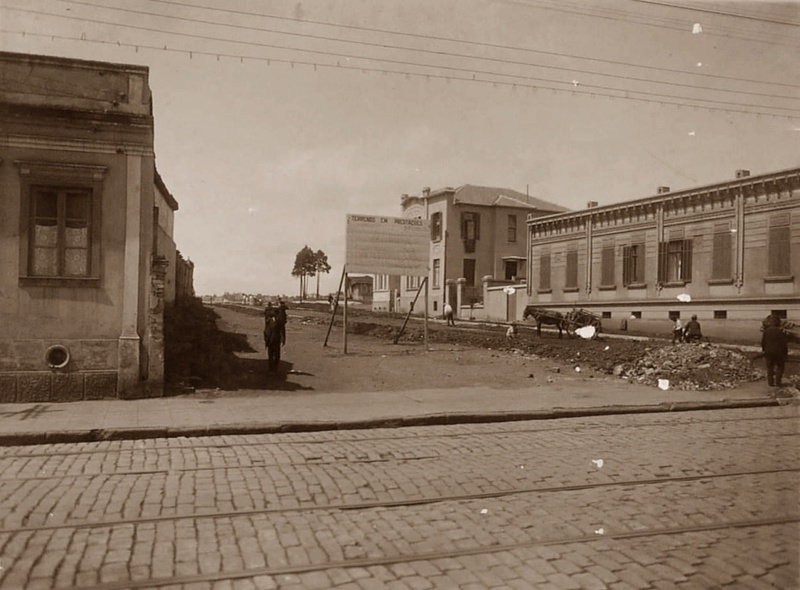 Photo: Câmara Municipal de São Paulo/ Acervo Histórico. Dom João V establishes the Capitania de São Paulo. Map of the Capitanias Hereditárias. Photo: Biblioteca da Ajuda. 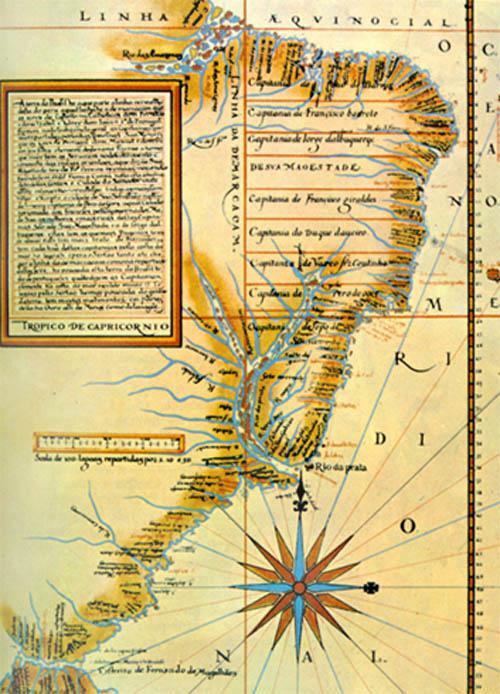 The Bandeiras (expeditions) of Fernão Dias Pais Leme are formed. 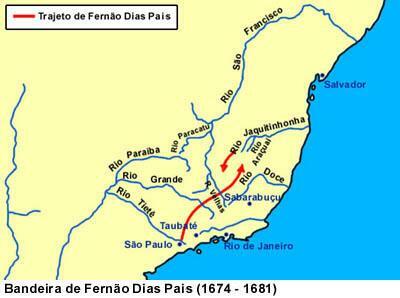 Illustration of the route of the Bandeiras. 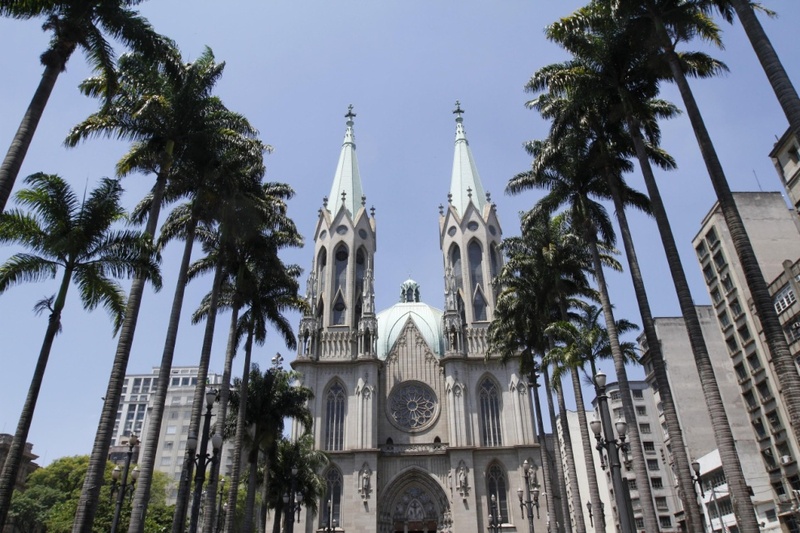 The Benedictines arrived in the city in 1598 and in 1634 the Abbey and the Chapel dedicated to São Bento (Saint Benedict) was created. Old Church and Monastery of São Bento built in 1598. 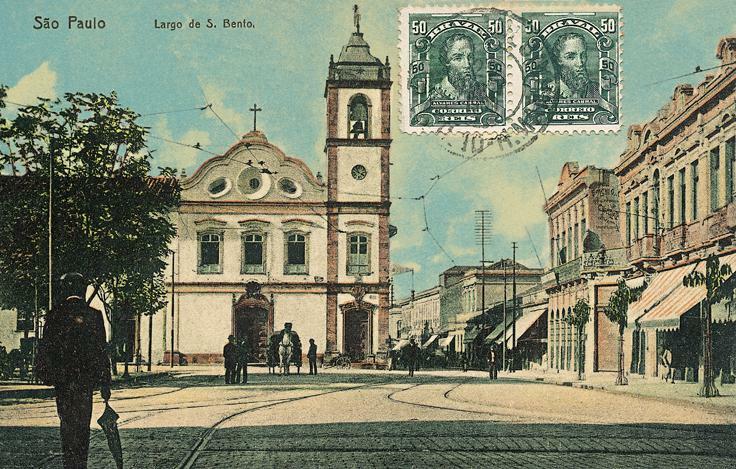 Photo: Postal Card – Carlos Cornejo – João Emílio Gerodetti. 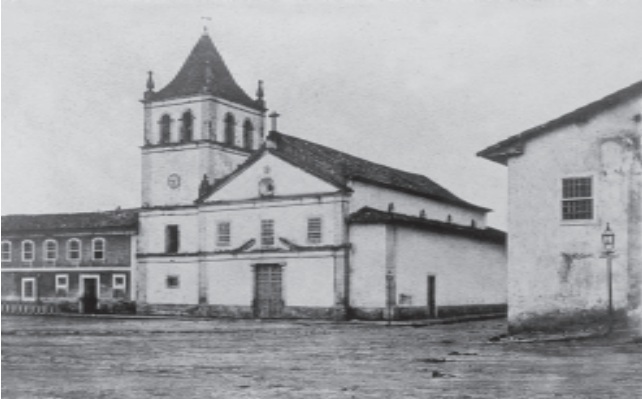 The first version of Igreja da Sé is established. It was Cacique Tibiriçá who chose the place where the city’s first temple would be found. First Version of Catedral da Sé – 1591. São Paulo is elevated to the status of village and the Câmara Municipal is created. Village around Pateo do Collegio. 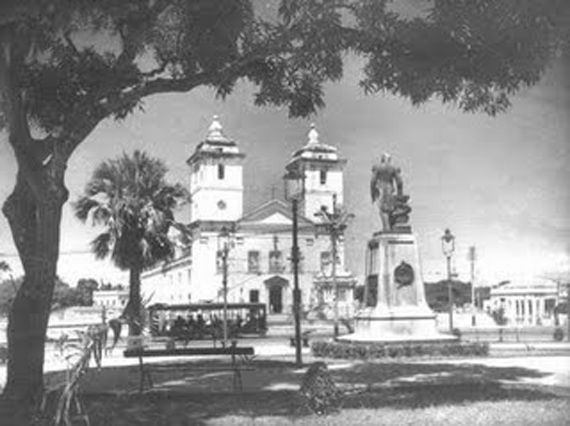 The city of São Paulo was established in January 25th, 1554; when Companhia de Jesus conducted the first mass at Pateo do Collegio. The main representatives were Manoel da Nóbrega, José de Anchieta and Manoel de Paiva. 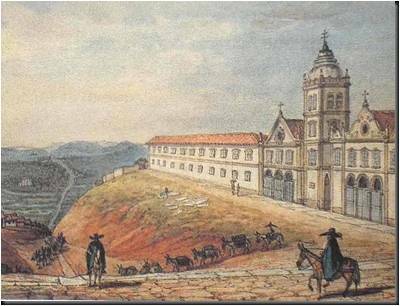 The Jesuits, who had the purpose of converting and transmitting their teachings to the settlers, created the site at Colégio de São Paulo de Piratininga. Pateo do Collegio. Photo: Acervo Museu Paulista da USP.